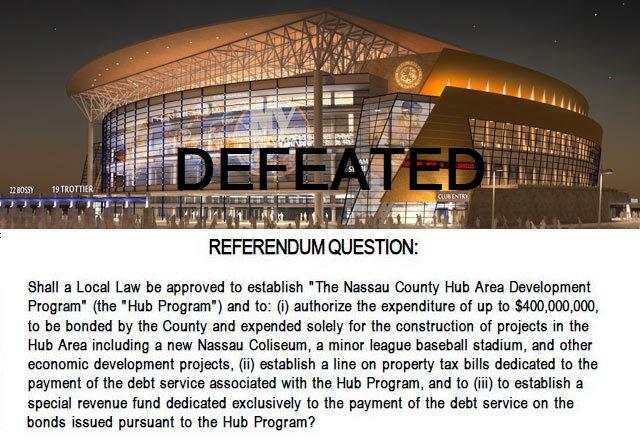 Islanders website: Has Charles Wang's comments on the defeat of the referendum & additional entry with comments from Wang, Garth Snow and Ed Mangano. ITV.com: Has several video interviews. News12 Live Press Conference Concluded: Ed Mangano kept saying he will continue to work to keep the Islanders here, and find additional options for the property. 1. Disappointed with outcome and heartbroken/emotional, did not want to make any comments or specifics on next steps. 2.Thanked all his employees and interns. 3.Thanked all the groups who worked for a Yes Vote. 4.Thanked his friend, Ed Mangano, and his staff for getting out facts. Felt soundbites decided issue, was very emotional. Is committed to Nassau Coliseum, will honor his lease for next four seasons, cannot wait for puck to drop with training camp, talked about season opener. Ended with Let's Go Islanders to applause. Garth Snow was also heartbroken, said he would keep working to build a winning team. I know folks will jump to conclusions, fueled by media....please stop because it's a lot of sensationalism, nothing more. Tune out the media spin, and use your own judgment. As written Saturday this was never a vote on the popularity of the New York Islanders, it failed in Pittsburgh for the Steelers, it's failed in other placed and things eventually got done. Over 67,000 people in a place where thirty-forty percent of the season tickets were outside of Nassau County, committed to a thirty year tax increase of fifty eight dollars. It's hardly a defeat in these economic times. An arena project will be approved here sooner or later, unless Mangano is determined to move on. If this vote took place in the Bronx to give the Yankees more money it would have been overwhelmingly rejected, same as any team in New York or New Jersey. Newark would have voted Corey Booker into oblivion if he tried to do the Purdential Center in a public referendum, same as Ed Koch in 1981 when Msg was threatening to leave. The New York Islanders did not have a politician willing to get it done in the backroom like everyone else, we had Ed Mangano. This defeat was about tax increases at a horrible time, nothing more. Charles Wang said Monday morning, there are four more hockey seasons here, and that means there is time for another plan. The framework is there for a compromise deal, it's going to get ugly, my thoughts are like most places it will get done. Monday was the day to congratulate Charles Wang, all the folks who worked so hard to get out a YES vote, and the people from the Islander staff, who have worked non-stop since early May. They did the NHL draft, prospect camp, and a daily campaign since May. Charles Wang, sure did predict the rain, I wonder if the storms came at the wrong time vs earlier when the older demographics likely would have been against it? Judging by the results, sadly we got the turnout wrong, but the result correct.